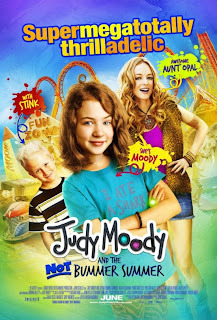 After posting last week about Judy Moody and the NOT Bummer Summer (Smokewood, June 2011; PG) movie tie-in books, I went to see how Judy translated to the big screen. I had already read some less-than-stellar reviews of the movie, and the novelization based on the screenplay didn’t live up to the original nine books. Even these warnings did not prepare me for how bad a film it actually was. 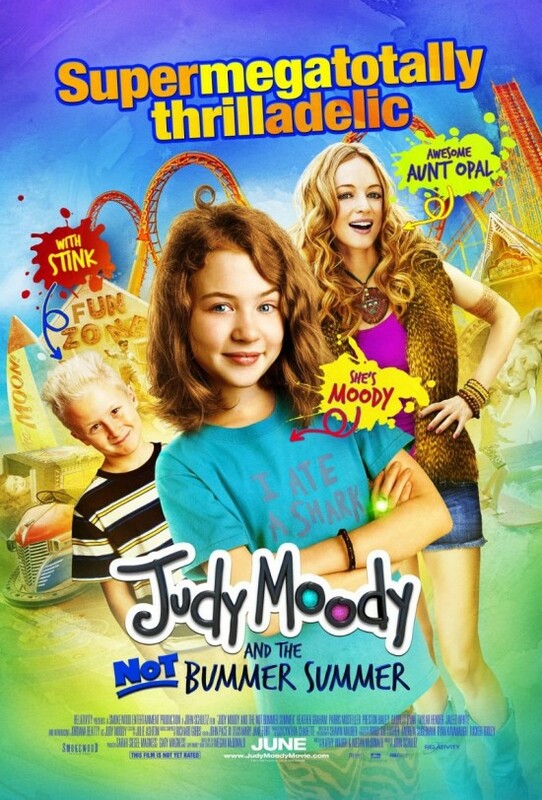 Judy Moody should have stayed in her books, as this was one bummer summer film. The story line focuses on Judy’s efforts to avoid a boring summer by creating a contest with her friends: the “Judy Moody Mega-Rare NOT-BUMMER-Summer Dare.” Obsessed with earning “thrill points,” Judy misses opportunities to have fun and focuses instead on the negative: her best friends’ going out of town, her parents’ leaving her home with little brother Stink and Aunt Opal (a.k.a.“Aunt Awful”), and all of her dares going awry. While Judy’s mishaps are entertaining, a sub-plot involving Stink hunting Bigfoot seems a bit random, although it does play a crucial role in the movie’s chaotic, action-driven ending. The director focuses too much on capturing outrageous reactions of the characters — or should I say caricatures? The overacting in this film verged on nauseating. Parris Mosteller’s portrayal of Judy’s younger brother, Stink, was particularly grating. Stink may be the little brother, but author Megan McDonald never makes him unlikeable in her books. In fact, McDonald started a separate series about him. But Mosteller’s almost nonexistent acting skills combined with his babyish speech (inconsistent with his character’s age) made me want to walk out of the theater. Big-name draw Heather Graham is probably most believable (and that’s not saying much) in her role as the fun but irresponsible Aunt Opal. Exaggeration worked with her character, although at times it still came across as overacting. Steve Urkel — I mean, Jaleel White — was forgettable as teacher Mr. Todd. Jordana Beatty as Judy, while fairly spot-on in capturing the beloved character’s quirky nature, was actually hampered by the Judy Moody lingo. On paper, “mega-rare” and “TOADally” work well, but when you hear them spoken aloud, the lines are just groan-worthy. Even though Megan McDonald was one of the screenwriters, this film did a poor job of representing what I love about the Judy Moody books: Judy’s a self-involved but relatively normal kid who says and does believable things. Kids relate to her. When the kids in my theater audience were not laughing during the film, I knew something was wrong. I quickly realized the film’s biggest problem: it talks down to its primary audience with characters so corny, overdrawn, and unrealistic that kids don’t find them funny. Moral of the story: don’t condescend to your audience. Judy Moody deserves more respect and so do her devoted fans. Roar! >I agree whole-heartedly. There was something forced about the film; the idea that it's all supposed to be cooky and fun–"ooh! Isn't Judy an original! She wears pajamas to school! "–when really it's just a drag and Judy is more than a bit of a jerk. And how pointless were her parents? >Bummer, Cin. I was hoping the AP had gotten it all wrong. Sorry you were disappointed.